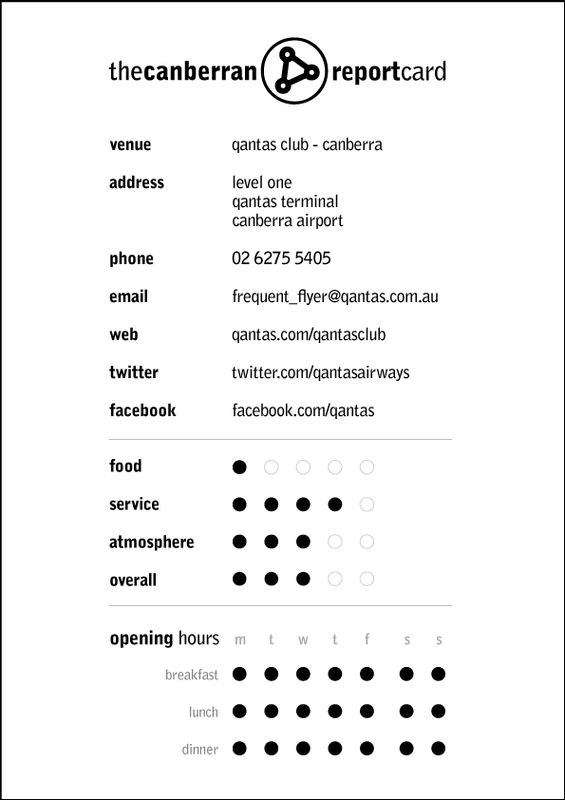 With these facts in mind, the Canberran spent 24 hours travelling 7,000 kilometres to check out four of the Qantas Club lounges. Were they more Jolimont Centre than realms of exclusivity? The highs and lows of our cross-country jaunt after the jump. I love the smell of a new guest lounge in the morning. An early start was intentional. Although not due to fly for another hour, I wanted to make sure I had time to take in the whole experience of the sparkling diamond of Canberra Airport’s redevelopment. There certainly is a feeling of airiness and space in the new terminal, with extensive signage pointing towards expansions to come. Just in front of the newsstand a set of escalators delivers travellers to an upper floor, where a circular landing provides entrance to three tiers of lounge (Qantas Club, Business Lounge and Chairman’s Club) radiating from the circumference. A freestanding desk backed by thin wooden strips from floor to ceiling greets members in an understated manner. The entry references the feel of the communal area just departed and offers a glimpse through to the main lounge. Warm light glows through from behind the two attendants, creating a welcoming feel. Australia’s own design wunderkind, Marc Newsom, was handed the reins to design the lounges in 2006(? ), and the style used in Canberra shows a mature confidence in development of the style thus far. Moving past reception into the main part of the Qantas Club the first feeling is one of space. Lots of space. Those familiar with the previous arrangement at Canberra airport will recall none-too-fondly a cramp, dark environment where, on Parliamentary sitting weeks, it was standing room only. The new, expansive lounge now provides ample capacity to fit both Houses of Parliament as well as all three hundred staffers who worked in Kevin Rudd’s office during his time at the top. The lighting is perfect, evenly distributed with highlights in the corners and behind the padded bench seats. Although it is still dark, five metre panels of glass display the blinking lights of the apron and runway. These windows open up the space beautifully, and paint a suitable contrast with the organic natural feel of Mr Newsome’s interior. The usual cold breakfast fare is available. Cereals, fruits, yoghurts and muffins line the simple buffet, while orange, tomato and apple juice swirl away in their chilled dispensers. The glasses and bowls provided are diminutive enough to constrain even the daintiest eater, requiring multiple trips and a shedding of self-consciousness in order to get a proper fill. The bircher muesli is a nice touch, but what on earth is with the bread? A constant letdown in Qantas lounges, as usual the thin, bland offerings have the visual appeal of cardboard. It’s only possible to differentiate the slices through their colouring (white, cream, light brown) rather than by any visible grain. TipTop’s Super Sandwichmaker more appealing. In fact, that’s probably what it is. More frightening is the steel behemoth sitting on the bench immediately next to the toaster. Allegedly this is a pancake maker, producing a couple of fluffy discs at the simple press of a button. Looking at a limp pair of pancakes recently abandoned by someone with an understandable change of appetite, I abandon this horror with the feeling its simply too early in the morning to consider such a device even a novelty. But over to important matters: the coffee. It’s difficult to hold much hope for a satisfying caffeinated experience after the culinary disappointments of the recent minutes, but thankfully Qantas delivers when things matter most. Over to the right, between the buffet and the bar, a hulking espresso machine, operated by an elegantly attired attendant, is dispensing black gold to early risers. It’s a Franke machine from Switzerland. Groupless but truly efficient in a way only the Swiss can manage. A request for a latte is greeted with a polite smile and effortless movement. Clearly this woman is at one with her machine. Within moments my request is presented, disappointingly in a cup, but I smile in thanks and retreat to my table, inhaling the aroma as I walk. The crema is good, holding together nicely and protecting hot milk from the rarefied air of the lounge. The first sip is slightly sharp, as most are, but on second approach the flavour is smooth, if perhaps a tad bland. The beans are obviously fresh, but the automated machine gives little opportunity to play with their qualities. Perhaps I should be grateful – I can’t imagine the horrors that exist out on the concourse. Thoughts of previous experiences (and prices) make me shiver. With my addiction serviced to a satisfactory degree it’s time to leave and catch my flight. As I join fellow travellers heading towards the exit, I notice there are no computers available for use. This seems a bit of an oversight given the needs of today’s business and travel but perhaps, much like myself, the machines are on their way.